BIG thanks to Plumeria Photography for capturing this recipe so beautifully! Christmas is just around the corner and in our home that means cozy jammies, fuzzy socks, and brunch with family before opening gifts by the Christmas tree! 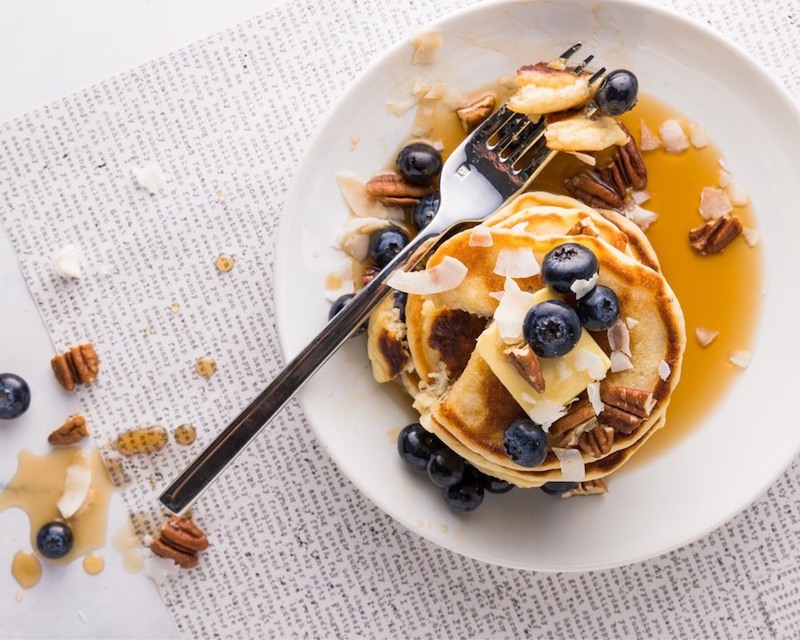 In years past, we’ve had Challah Bread French toast, Croissant French Toast, and Texas Toast for Christmas brunch – but this year, it’s all about the pancake. 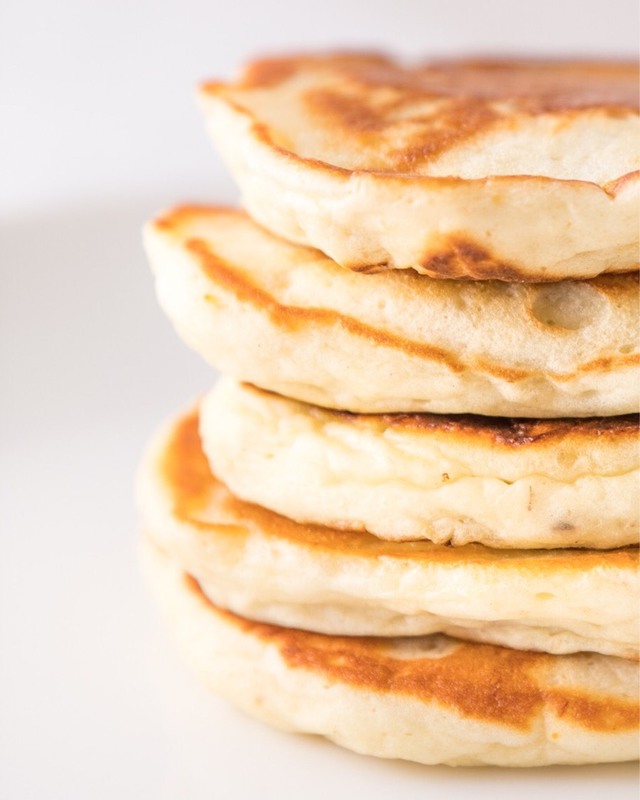 I’ve loved pancakes forever… in high school, I nannied for the family that started the Original Pancake House chain, and I remember asking them to teach me how to cook a perfect pancake. It’s all about low, slow heat! I fell in love with baking (and tasting) different varieties of ‘cakes so muchthat my obsession for the breakfast food is the first thing I talked to my husband about… truly! Back in the day, when our courtship was juuuuuuust starting, we were emailing back and forth and I told him that I loved pancakes so muchthat I hoped to write a book about them one day! There are infinite pancake varieties that can be made by swapping a few ingredients, but theseRicotta Blueberry Pancakesare special because they’re fluffier and thicker than most other ‘cakes—while maintaining an incredibly light texture and flavor. If you haven’t tried ricottapancakes before, don’t be put off: you won’t taste the cheese! The ricotta helps these pancakes reach the ultimate level of “fluff”. Plus, the banana in this recipe provides a subtle sweetness that pairs so well with blueberries and maple syrup! This recipe can be made gluten-free by substituting your favorite 1:1 gluten-free flour. These beautiful are by my dear cousin and incredibly gifted photographer Cacey McReavy, owner of Plumeria Photography. This recipe serves two—because I made it for my husband and I! 1. Combine ricotta, flour, baking powder, sugar, salt, milk, egg, extract, and bananas in a blender and pulse on low until an even consistency forms. 2. Heat a nonstick pan or griddle over low-medium heat and spray with your preferred nonstick or a bit of butter. Pour ¼ c. of batter onto the heated griddle. Then, sprinkle a few blueberries to the top of the batter. Cook for 2-3 minutes, until bubbles begin to come to the top of the batter and bottom edges look golden brown. Then flip and cook another 2-3 minutes. *For golden pancakes, opt for lower, slower heat! 3. 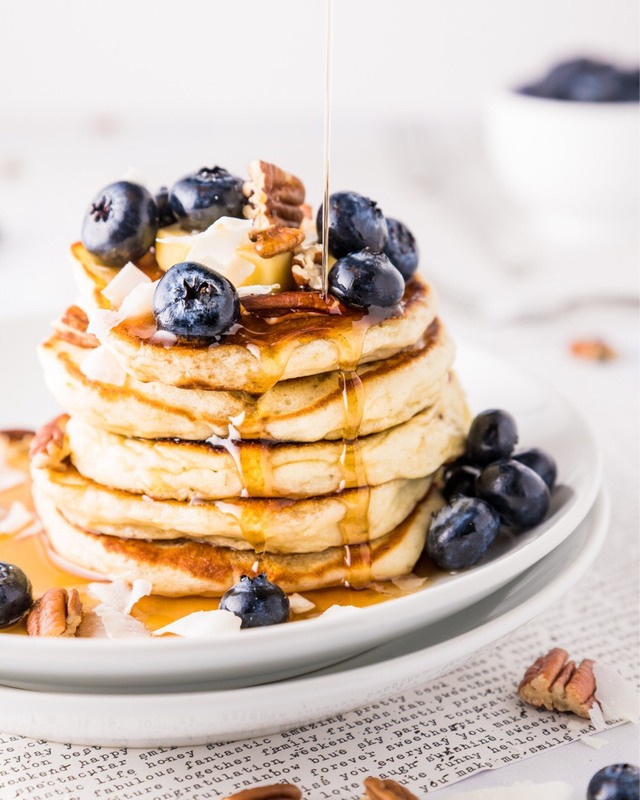 Enjoy with pecans, blueberries, and good maple syrup - and be sure to share with your favorite person!